Bharat Sanchar Nigam Limited as a Public Sector Unit i.e. PSU is a dream destination to get a government job. Every year several young graduates join BSNL as JE (earlier TTA) or JTO or JAO. If you are looking for Best BSNL JE books or busy in BSNL JTO exam preparation; this post will help you to select a genuinely good book. 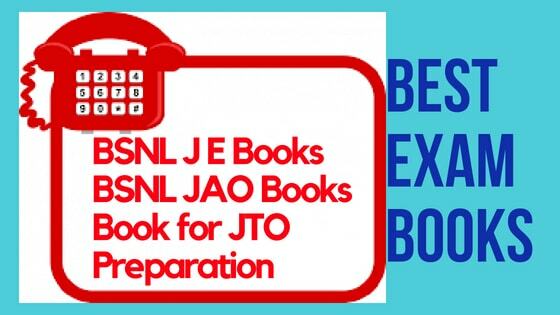 Even if you are looking for BSNL JAO books, we are covering them too. We are not making a long list of books rather we are suggesting the best option available in the market. BSNL JE Career: Candidates join BSNL as JE by clearing two steps of selection. BSNL Junior Engineer exam is basically a test of theory contents. If an aspirant prepares junior engineer syllabus in a strategic way, this exam is very easy to crack. The key point of success in JE exam is “multiple revision of theory”. To score well in basic engineering and in your specialization section, you need to go back to your basics. Yes, you got me correct. Take once again your core books of Physics and Maths for a thorough revision. In fact, for any competitive exam, preparation should be started with the revision of elementary portion. Once you finish your elementary revision, you can have one book from the recommended section. "Guide to BSNL Telecom Technical Assistant Junior Engineer (Erstwhile TTA)"
Book Review: In JE exam, basic concepts are tested. If you are going through all your specialization books that would be always a better option. However, this book can also be used for JE exam preparation. The only condition is that the aspirant must have some previous knowledge. This book covers almost all topics still few topics are not covered widely. Basically, this book is for revision purpose. Each chapter is followed by a good number of MCQ and it is always available with the concessional price on Amazon. Honestly speaking, it also has several printing mistakes. The reader can find a repetition of questions and spelling mistakes. At several places, important formulas are skipped. "Gateway to J.E by Ashish Dixit & Mayank Srivastava"
Book Review: This book also has good reviews. It covers almost all the essential Topics. But, like all other books, you can rely on it for the specialization part. A single book cannot cover all which you have studied in multiple semesters. But, one can take this book as a part of preparation strategy. Upkar publication books are most liked books among BSNL JE aspirants. Book doesn’t fit your requirements if you are looking for solved previous year papers. BSNL JE syllabus is divided into three sections. General Ability section covers topics like General English, General Studies, Aptitude and Reasoning Test etc. But the weightage of this section is only 20 marks. If you are securing 10 marks in this section, that will be sufficient to hit the target. Preparation Tip: As this portion has just 10% of full paper, a candidate can practice for this section 5 or 10 days from any General English book made for the competitive purpose. Avoid guessing as negative marking is there. Preparation of this section is most important as it makes difference between winners and looser. 90 questions from all branches of Engineering will cover almost 45% of the paper. Preparation Tip: Try to cover in diploma level syllabus in 15 to 20 days for following topics/branches. Do practice for equations, definitions, and important basic points. Your books of the first semester will help you a lot. You can buy any one book out of two given above. But, you need to stick to the syllabus. 3. Specialization: This section will also ask 90 questions covering 45 % of the paper. This is the toughest part of the paper and cut off marks for this section of JE paper is 30. Preparation Tip: Read your core engineering books for the last two years. Focus on knowledge-based questions to cover complete theoretical aspects. Prepare given topics in the sequence they are given below. Once you revise complete BSNL JE syllabus, go for solving all the previous year’s questions papers of the BSNL. Whenever we do solve old papers, it helps us to check our preparation level in reference to speed and accuracy. Comment in the box, your choice for BSNL JE Books for the upcoming exam.